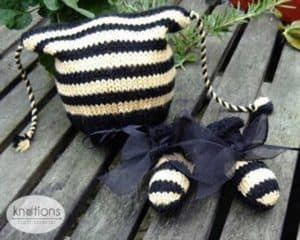 This is an easy knit hat and bootie set made from worsted/aran Merino yarn and is adorned with black satin and organza ribbons which are unusual on a baby’s garments. The hat is knitted on double pointed needles avoiding seaming but could easily be knitted flat on circulars with back seaming. A black ribbon through the ribbing makes the brim adjustable for different sizes. 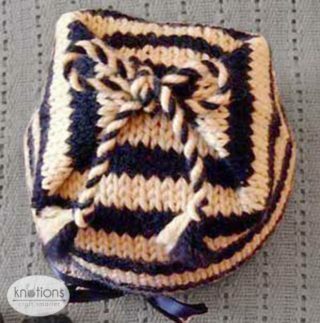 Twisted cords can be tied to make a little parcel for a rounder look or left to make a square shaped hat. The booties are knitted in a tighter gauge so they have 4 row stripes to match the width of stripes on the hat. They are knitted flat from the sole up and stitches are picked up around the ankle of the upper to knit a ribbed cuff which is seamed at the back continuous with the heel. Black organza ribbon ties on the booties resemble the translucent wings of bees. To fit baby from 3-6 months. Hat can be adjusted to fit smaller size if ribbon is tied more tightly. Booties can be lengthened or shortened by adding or subtracting multiples of 4 rows (to match stripe pattern on upper) in the middle of the sole and then adding or subtracting the same number of rows in the top of the bootie. Debbie Bliss Cashmerino Aran in Black and Yellow, or any worsted/aran weight yarn that knits to the same gauge in Black and Yellow or Gold. 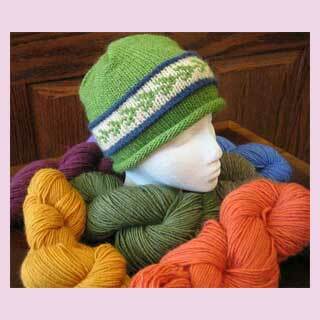 Knit each new color in the round as normal. On the second row of the new color, insert right hand needle tip into stitch below the first stitch in the round on your left hand needle. Pick up this lower stitch and slip onto your left hand needle and then knit this with the first stitch already there together. It isn’t completely invisible as it will look like a slipstitch but it’s not quite as stepped as ignoring the color change and the less critical eye will not notice at all. It really works better the more rows you have in your striped sequence and on a smaller gauge. I used it here however so that from a distance each color stripe looks more or less continuous without a little jump. It still beats having to sew the seam up at the end I think. Stripes of three rows each make it difficult to knit on straight needles because you’ll need to start a row at either end. 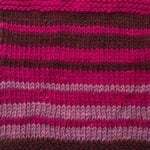 However, the pattern could be adapted to 4 rows per stripe and knitted on straight needles with a seam up the back, adding a couple of stitches to account for the seaming. Using US #7 (4.5 mm) dpns and Yarn A, CO 68 sts and divide evenly between 4 dpns. Pm for beg of rnd and sl m each time you get to it and a rnd is completed. Work 4 rnds in k2 p2 rib. Work a further 4 rounds in k2 p2 rib. Cont until 10 stripes (30 rnds) have been completed. Keeping start/finish of the rnd as center back, place 34 sts from the front of the hat on one dpn, and place the rem 34 sts on to another dpn. Using a third dpn *put tip through front leg of first st on the front dpn, then at the same time slip through front leg of first st on back dpn as if to knit. Knit these two sts together. Rep from * again so that you now have two sts on the right hand needle. Pass first stitch over second exactly as you would normally do to bind off. Rep from * until all stitches have been bound off. Try not to pull too tightly as you go. Turn hat inside out so the RS of each faces outwards again. You will see that you have a neat seam on the outside with a very small ridge on the inside. I think this preferable to sewing as the neater edge makes for a better drape in the top of the hat. However, if you prefer to bind off all stitches and sew the top seam of the hat that works too if you make sure the seam is not too bulky. Cut 3 lengths of Yarn A and 3 lengths of Yarn B about 3 ft each (1 meter). 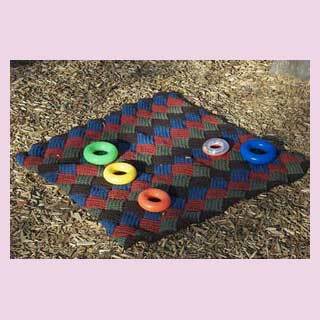 Tie ends of yarn together to make circle of yarn. Loop yarn over door handle, chair post, or chair leg. 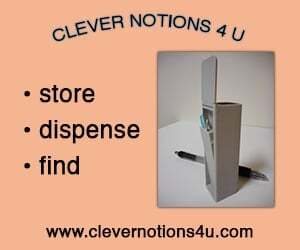 Insert a pencil, pen or dpn into loop at opposite end. Pull taught and twist yarn by spinning pencil/pen/dpn. Keep twisting until yarn is so tight it is almost pulling back on itself. Slide a finger half way along length of twisted yarn still keeping end taught. Fold yarn twist in half and put loop/pencil/pen/dpn together with loop over door handle (post or leg). Let go of finger holding halfway mark and allow yarn to twist on itself. Tie knots at the beginning and end of the cord to secure the twisted strands and cut below the knot to give it a small tassel. Take the whole length of the twisted cord and tie two more knots either side of the center and cut between these knots so that you now have two twisted cords with knots each end to secure the strands. Attach one twisted cord to one of the top corners of the square hat and another twisted cord to the other top corner. These can be tied together into a knot or bow to make a round hat with the top corners folded in to look like an envelope or left to hang making the hat square as in the photos. Cut 1-1/4 yard (1 meter) of the thinner black satin ribbon and thread through eyelet holes with the ends coming out at the center front where they can be tied and tightened to make an adjustable brim. Rep these two rows until 5 sts rem. Begin upper as follows. 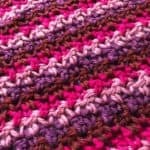 Join yarn A and keeping striped pattern sequence, repeat Rows 3 and 4 another 3 times; 13 sts. Cont in st st (K RS row, P WS row) in striped pattern until there are 5 stripes i.e. A,B,A,B,A color sequence. K4 and leave sts on spare dpn or stitch holder. K4 and continue rest of upper side on these 4 stitches. * Cont in st st (K RS row, P WS row) until 8 stripes (32 rows) have been completed from the beg of upper and striped pattern sequence. Beginning with a WS (purl) row, cont in striped pattern sequence repeat from * to end and cast off all stitches. 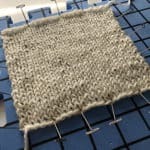 Continue in k1 p1 ribbing until 10 rows have been completed. Join bound off edges of center back heel seam and back ankle seam on ribbing. Join upper and sole together along a seam around the edge of foot. Cut 1-1/4 yards (1 meter) of organza ribbon and divide into two pieces. Sew each piece firmly to the back of the ankle on the heel seam and tie around ankle ribbing and make into a generous bow.